Ag paste is made using pure silver metal and it is well known for its highest electrical conductivity, thermal conductivity, and reflectivity. The low price trends of silver have kept the demand for silver relatively low. Owing to these properties, Ag paste is extensively used for in production of solar cells, electrical and electronic components, and automobiles. The report states that the global Ag paste market will reach a valuation of US$4.5 bn by the end of 2024 from US$1.9 bn in 2015. The overall market is expected to expand at a CAGR of 10.0% between 2016 and 2024. The development of the solar industry has triggered the demand for photovoltaic cells in recent years. Demand for PV capacity is likely to rise to about 600 GW by 2020, which is projected to boost the demand for Ag paste during the forecast period. Technological developments have increased the applications of silver paste in automobiles as it is extensively being used for making printed circuits of defogging systems, alarm circuits, and antennae. Silver paste is also used for manufacturing multilayer ceramic capacitors, polymer inks, low temperature coal-fired ceramics, and adhesives, which are used in electronic and electrical components such as capacitors, resistors, and circuits. Thus, growing demand for electronic and electrical appliances is estimated to boost the demand for Ag paste during the forecast period. On the basis application, the global market is segmented into thermal interface material and EMI shielding. Currently, thermal interface material segment accounts for a significant share of Ag paste market. The Ag paste consumption in thermal interface materials (TIMs) application is expected to be high due to the increasing demand for TIMs in photovoltaic cells and electrical and electronic components. The high conductivity, contact resistance, and adhesive strength of Ag paste has increased its applications in various end-use industries. On the other hand, the EMI shielding is expected to experience a narrow demand due to availability of low price substitutes in certain applications. Substitutes such as copper, aluminum, carbon nanomaterial, and conductive polymer have been used as alternatives in certain applications but they do not match the performance efficiency of Ag paste. Geographically, the Ag paste market is been segmented into regions such as North America, Europe, Asia Pacific, the Middle East and Africa, and Latin America. 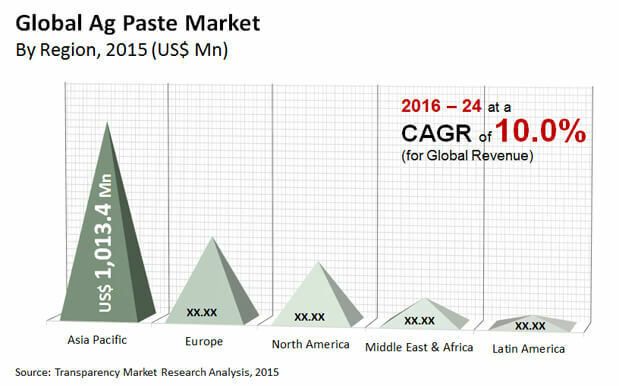 Demand for Ag paste was the largest in Asia Pacific in 2015 followed by Europe and North America. The forecast growth in North America and Europe is anticipated to be low due to the withdrawal of government support & subsidies on solar equipment and products. Asia Pacific is anticipated to experience high growth for the forecast period due to the growing economies such as China India and Japan. The growing demand for solar energy and high subsidies from local government bodies in China, India and Japan is expected to boost the demand for Ag paste market in Asia Pacific Region for the forecast period. The key players operating in the global Ag paste market are Targray Technology International Inc, DuPont, 3M, Metalor, Johnson Matthey, AG PRO TECHNOLOGY CORP, Cermet Materials, Inc., CHIMET, Henkel AG & Company KGaA, and Heraeus Holding are amongst others. Ag paste is a uniformly dispersed mixture with multiple inorganic and organic components. It is well known for its highest electrical conductivity, thermal conductivity and reflectivity. Ag paste is produced from pure silver metal which is extracted from the earth’s crust. Silver is also produced as a byproduct of gold, copper, zinc refining, and lead. It is considered as one of the precious metal. Ag paste is mainly used in end use sectors such as solar cells, electrical & electronic components, and automobiles. Ag paste market is divided on the application segment such as Thermal Interface Material, EMI Shielding. The report provides in-depth analysis and forecast of the Ag paste market on the global as well as regional level. The report includes forecast for the period from 2016 to 2024 in terms of volume (tons) and revenue (US$ Mn). Quantitative data has been derived through extensive secondary research of the global Ag paste market. Secondary sources typically include company websites, relevant magazines, government documents, and press releases. The top-down approach has been adopted to derive the regional numbers from global revenue and volume figures. Furthermore, the bottom-up approach has been employed to derive data for various source segments based on demand for Ag paste in each geographical segment. A combination of top-down and bottom-up approaches helps in validation of the quantitative data of the market. The data was further validated with the help of primary research with industry experts to ensure accuracy of derived numbers. Detailed analysis of various factors driving the global Ag paste market has been included for astute decision making. Impact of these drivers during the forecast period has been included with data to substantiate research findings. Furthermore, factors restraining market growth have been included for better understanding of the market. Impact of these restraints has been analyzed over the forecast period. The report also comprises various opportunities available for market growth over the next eight years. Opportunities entail untapped or recently explored factors that are anticipated to drive the Ag paste market during the forecast period. The report includes value chain analysis to help understand the industry thoroughly. Value chain analysis comprises detailed evaluation of the roles of various entities involved in the Ag paste industry, from raw material suppliers to end-users. Various processes employed in the manufacture of Ag paste have been included in the value chain analysis. Porter’s Five Forces model has been included to determine the degree of competition in the market during the forecast period. Furthermore, market attractiveness analysis has been conducted to analyze application segments that are expected to be lucrative during the forecast period. This is based on various factors such as market size, growth rate, profitability, raw material procurement, and competition in each application segment. Based on application type, the Ag Paste market has been segmented into thermal interface material, EMI shielding. The report comprises detailed analysis of all the segments in the regional and global markets and forecast based on current and future trends in the industry in terms of volume (tons) and revenue (US$ Mn). In terms of region, the market has been segmented into North America, Europe, Asia Pacific, Latin America, and Middle East & Africa. Demand for Ag paste in each application segment type has been analyzed and forecast for a period of eight years. The report also comprises profiles of leading companies in the Ag paste market. These include DuPont, 3M, Metalor, Johnson Matthey, Cermet Materials, Inc., AG PRO TECHNOLOGY CORP, Heraeus Holding. Various attributes of these companies such as company overview, business strategies, and recent developments form the core of the company profiles section.